I define minimalist as a style that uses pared-down design elements. The artist strips everything down to its essential quality, to achieve simplicity. We asked our CIJ Friends what they love and/or offer in the minimalist style; here’s what they sent in. Finding a heart beach glass piece is rare. With as little wire as possible, I wrapped the piece so that the heart is the highlight. These came from an idea I had to turn shapes into an illustration and was watching Robots with my kids at the time. This simple chain necklace has a beautiful Tanzanite stone surrounded by a gold filled disc. This necklace looks great alone or paired with other chains! When I begin to knit this purse it is very simple, just a plain minimal little purse with very little character. As I continue to build upon it with its flower and beading it grows into a sophisticated clutch handbag that is one-of-a-kind. People who have these purses always share their compliments with me that they receive. Simplicity and beauty speak for themselves. This choker features a trio of beautiful beads….vintage German lucite and champagne tubes. Beauty that stands the test of time and can be worn effortlessly! Many of the items in my shop are simple or minimalist, as that is my own favourite style. I have chosen to showcase this Harris tweed tea cosy. Far from the bright colours and bold tartans of some tweeds, this cosy is made from two almost-plain weaves. A cosy made from just one of them might even look dull. By joining them with a straight horizontal line, together they bring out the best of both pieces. Simple message for a positive idea: help kids celebrate who they are – give them goals and help them achieve success, but let them know they don’t have to change who they are to get there. I chose this vintage piece for it’s simple lines and understated character, discovering later that it is an early 20th century cemetery / funeral vase. While I enjoy a lot of fancy, ornate, and unique items with pretty colors mostly, sometimes something simple with nice lines, unique simple shape, or something useful that will match or go with anything will touch my soul….. This bracelet is pretty, simple, dainty, and yet it will go with most anything and white Pearls and black Onyx have a classic, timeless, and elegant appeal! I hope you enjoyed these wonderful treasures and stories as I did! Fabric yo-yo’s are small circles that can be used to add texture to a quilt. They can be sewn on as the center of a flower or you can even make an entire quilt just out of them. Pictured is an example using them as centers. You can see they give the quilt some added dimension. Place your fabric face down and trace around the fabric with your bowl or other round object. Once traced, but out your circle. If you’re planning on making several yo-yo’s at a time, it might be easier to trace and cut multiple circle before stitching them. Next comes the sewing part. Turn in 1/4″ of fabric and start loosely stitching around the fabric in semi-wide stitches in order to make it easy to pull the thread through. Continue folding in the fabric and stitching until you have sewn all of the way around. This is the stage where your flower starts to take shape. Start pulling the thread tight. Pictured is what your flower looks like mid-stage as you are pulling the thread through. Here is a close up of the finished yo-yo which is 2.5″ diameter. When you are done pulling the thread through,stitch the thread through the center to secure the bottom side of the yo-yo. You can then either knot and cut the thread or leave the thread long on the other side and use it to sew the yo-yo to the quilt, depending on your preference. Finally here is your finished quilt with yo-yo’s. 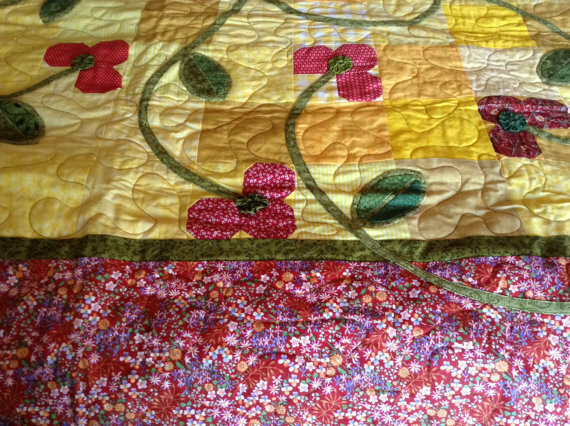 As you can see, this extra touch on the quilt really adds texture and finishes it off nicely. If you quilt or are just getting started and haven’t used this technique. Give it a try. Autumn is upon us and I think it’s safe to say the majority of people start thinking right away of one thing: pumpkins. Pumpkin bread, pumpkin pie, pumpkin carving, pumpkin seeds, and of course, pumpkin spiced lattes. So what better way to kick off October than with a whole post dedicated to pumpkins? Decorating for the fall is always fun because there is so much that can be done. Why not go the extra step and snazz up your kitchen table or counter with cute festive potholders? Or maybe you do what I do and hang them against your backsplash and forget to take them down until the 4th of July. Pumpkin Spice Soap Handmade Soap from Comfort and Joy Soap Co.
Have you ever loved something so much you wanted to bathe in it? That’s how I feel about pumpkin spice and I know I’m not alone. Luckily for us, we can! Quite literally, with pumpkin spice soap, you can smell like your fall favourite all day long. Not a pumpkin fan? Lisa has a vast array of other soaps for you to lather up with! While searching for pumpkin themed items, how can I pass up a shop called Pumpkin Tree Lane? These mini stacked pumpkins stand just under 2 inches when stacked together, but display individually as well. Perfect for someone decorating a small space, or those like me who simply enjoy tiny tiny things. Happy October and Stay Inspired!